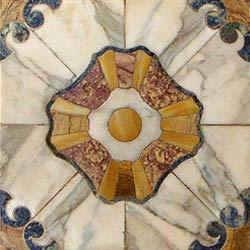 This square shaped tile exhibit an ancient look with its work of medieval period. The shades of yellow and brown colors have been creatively used in the tiles for bringing out that true contemporary feel. A prominent rhombus shaped pattern with surrounding borders makes the inlay tile charismatic in appearance. Incepted in the year 1991, at Jaipur, (Rajasthan, India), we, “G S Marbles”, are considered as the eminent Manufacturers, Exporters and Suppliers of a collection of Indian & Imported Natural Stones and Artifacts. These are designed and developed by our experienced craftsmen and are known for their mesmeric beauty, pure content, exclusive designs and variety. Our membership with leading government authorized organizations such as Export promotion council of SEZ and EOU, New Delhi, Export promotion council of Handicrafts, CAPEXIL, Government of India and Raj Chambers of Commerce and Industry has made us a trustworthy and reliable company for our clients. We have appointed a team of experienced and creative designers who work round the clock to facilitate our clients with best quality products. Moreover, they work in close coordination with our Customers to understand their requirement and thus can also customize the range as per their requirement. Further, to offer flawless collection of products, we have used best quality raw material in the manufacturing process. Further, these products are quality tested by our quality auditors, which also assists us in providing our clients with flawless collection. Also, we have gained global presence with our esteemed clients in USA, UK, Europe, Middle East and Australia.